Featured in several nationally-recognized sports publications, the e3Fitness Grip is a revolutionary biomechanical hand positioning system for walking and all athletic activities, and for those who are recovering from lower limb injuries. 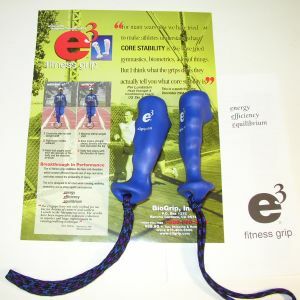 Three Pack includes three (3) pairs of e3grips plus an instruction booklet and link to short online video. These grips are a 7% size reduction from the standard size grips, and are referred to as the "e3grip-093" These new grips are available in Purple or Pink. e3 grips available in Blue or Black.